Fort McMurray: Gordon and Doreen Williams were with the Wood Buffalo assembly for the weekend of December 14-15. Gordon spoke at the children’s Christmas program, and also gave ministry on the Monday night. The Christmas program was attended by a number of parents and children, with some in for the first time. On December 31, the assembly held a New Year’s Eve meeting, starting with a pot-luck supper and followed by singing, prayer, gospel, and ministry. Vancouver: Andrew Bergsma visited a few assemblies in the area in December. During December, several thousand Chinese/English calendars, published by the International Bible House, were distributed by a number of area assemblies in their respective communities. North Vancouver: David Jones visited the Deep Cove assembly in late November. The saints also enjoyed a weekend visit from Andrew Bergsma in late December, and a week of ministry in early January with Dave Richards on 2 Peter. Gordon Williams was expected January 25-28 for ministry. Moncton: Peter Ramsay and Matthew Cain had gospel meetings from November 23 to December 7. The saints were encouraged with large attendance and the salvation of two precious souls, one a young boy from Sussex. Our brother Ramsay had a very clear gospel message to the children at the Sunday school program. L’anse Au Loup: Eric Fowler was home for the weekend of December 13-14, and helped for a couple of days distributing calendars door-to-door in Quebec. The annual Sunday school programs went well in all three south Labrador assemblies with a full hall in each place. English Point was on December 21, Red Bay on December 22, and L’anse au Loup on December 28. Sandringham: Wallace Buckle was here for a children’s treat on December 20 and for the Lord’s Day. A nice number were in for the evening meeting where they heard the gospel. He also helped on Saturday and Sunday with distribution of calendars and literature. During December, 1400 calendars were delivered. Clinton: The saints enjoyed ministry by Philip Coulson on October 23. Gospel meetings by Marvin Derksen and Brad Hutchison were held November 9-30. Despite adverse weather conditions, God’s hand was seen in salvation. Continue to pray for others that heard and have not yet responded. Alex Dryburgh gave helpful ministry on Lord’s Day, January 4. Grimsby: The assembly had one week of children’s meetings with Brian Owen from December 8-12. The gospel messages were faithfully spoken to an attentive audience. Strongville: The saints were encouraged by a gospel effort with David Booth and Brian Owen from November 9-19. Some local contacts attended. The assembly also had eight weekly children’s meetings in a rented building in the nearby village of New Lowell with local brethren participating. Jim Jarvis gave help with a gospel message on December 13 at the final prize night. As an answer to prayer, a new child came out each night. In the Fall, the assembly also received helpful ministry from a number of brethren including Harold Paisley, Stu Thompson, Al Cook, and Gary Sharp. Sudbury: The assembly held its annual mini-conference December 13-14, with ministry given by Brian Crawford, Alex Dryburgh, Robert Dryburgh, Lorne Langfeld, and Bruce Rodgers. The saints appreciated the Lord’s servants being with them and the ministry given was needful and encouraging. Windsor: The assembly enjoyed four weeks of well-attended gospel meetings in November with Bruce Cottrill and Andrew Robertson. The gospel was preached nightly with power and solemnity, and the Lord blessed in salvation. The Lord’s people were refreshed and encouraged. Children’s meetings were held for eight Monday nights during November and December. Attendance was excellent with the gospel well presented by visiting speakers as well as young brethren of the local assembly. The assembly appreciates this exercise of younger brethren and sisters. Summerside: The Island assemblies held a Fall conference on November 22-23. The subject titled “Honest Questions – Humbling Answers” dealt with foundational assembly truths relevant to the 21st century. The meetings where shared by Dr. Sandy Higgins, Peter Ramsay, and Matthew Cain. The meetings were very practical and many of the saints expressed appreciation for the ministry given, and felt they had been helped in their understanding of these basic foundational truths. Taylorside: E. McCullough and R. Weber plan to start gospel meetings on January 18. Alpena: The assembly distributed about 180 calendars, texts, and tracts on the last Lord’s Day of the year. Louis Smith, who was passing through, lent a hand with the distribution. The assembly also profited from helpful ministry given by brother Smith during his one-day visit. Phoenix: The Sunnyslope assembly was blessed in December with a week of ministry on Ephesians by E. Parmenter, and a week of ministry on prophecy by F. Krauss. Ministry by S. Wells at year’s end was also appreciated as we look to the One Who holds the future. Brookfield: The assembly recently concluded an encouraging series of children’s meetings with a number of new children and some parents out at each meeting. Dunkerton: Joel Portman gave an appreciated visit recently. Pray for gospel meetings being held by Robert Orr and local brethren in Elk Run Heights during January. Hitesville: B. Rogers and W. Skates started gospel meetings here January 4. Augusta: The saints appreciated Albert Hull’s “Servant” ministry from Isaiah on December 4. Also, Ken Taylor’s visit was appreciated on December 20 for the Sunday school Christmas dinner. Saugus: The assembly was blessed with one of their largest conferences, with a good number of younger saints attending. The Lord gave help and the Spirit directed the ministry to treasuring things that are important to God, and having a likeness to Christ in our service to Him and to one another. Those who took part were M. Derksen, E. Higgins, A. Hull, S. MacLeod, J. McClelland, E. McCullough, J. Meekin, D. Oliver, D. Petterson, and D Shutt. On Monday following the conference, D. Shutt spoke the gospel at the rehab center where we have been meeting regularly over the past two years. There were 15 unsaved present. Please remember this effort in prayer. E. McCullough had one night’s ministry, reminding us of our riches in Christ, knowing the will of God, and the indwelling Holy Spirit. Albuquerque: Wm. Skates and Roy Weber are planning gospel meetings, Lord willing, starting February 8. New York City: Joseph Chung conducted a week of ministry meetings with the Flushing assembly from the book of Esther in December. The saints appreciated his uplifting and challenging ministry in these difficult times. Ted Chambers (Midland Park) preached the gospel to ESL students from Korea, Vietnam, and the Philippines in our monthly gospel outreach meeting held on December 20. The saints are grateful for continued prayer for the furtherance of the gospel. Akron: James Smith visited us for ministry in December. He also paid appreciated visits to Mansfield and Cleveland. Hatboro: The saints recently enjoyed a visit and ministry from Eric McCullough. Albert Hull plans to have a short gospel series in February 1-9 using his chart on Future Events. John McDowell writes, “As these last days hasten toward His return, the scene becomes darker and more confusing with problems increasing, yet we have much to praise God for. There has been an increase in gospel activity in this South-East corner of Queensland during the last 18 months. There have been eight series of gospel meetings with encouraging blessing, and some have been baptized in eight different assemblies. Such activity has not been known for many years in this land. The wonderful privilege has been ours of continuing another year to display good gospel verses on highway signs right across this land. This rejoices our hearts as we think of the millions that read those verses every day. We thank God for such an open door which He has set before us, and also to be counted worthy to share with the Lord’s dear people in spreading the wonderful message of salvation in the distribution of gospel literature to approximately 1,000,000 homes. The Lord has been pleased to use this in the salvation of souls. Our young brother, Clive Barber, recently commended to the work and now in fellowship in Cooroy, has been sharing in the work with me, and is worthy of the prayers and support of the Lord’s people. Ciudad del Carmen Island: Fifty believers delivered some thirty thousand texts on this island towards the end of December. Gospel meetings are underway and one young man has professed faith in Christ. David Alves Jr. expects a group of six Venezuelan believers to help him during the month of February. Puerto Vallarta: Donald R. Alves, of Venezuela, had three very helpful Bible readings with the Coapinole assembly on the subject of Church Truth, leading up to the annual conference. Brethren Tom Baker, Marcus Cain, Chucho Gomez (Zamora), Dan Harvey, Raul Martinez (Mexico City), Paul Thiessen, Gilberto Torrens, and Jason Wahls also helped with the ministry and gospel preaching. Miguel Mosquera gave a report on the Lord’s work in Panama. Two believers obeyed the Lord in baptism. Veracruz: One hundred and eighty believers from Canada, Mexico, United States, and Venezuela joined in delivering 150,000 Bible texts in this port city of Mexico�s Gulf coast. During the daily morning devotions, David Oliver spoke by interpretation on the subject of “The Servant Songs in Isaiah.” John Nesbitt has rented a building and Harrys Rodriguez is helping him with the preaching. After one week of meetings, our brethren are very encouraged with one man professing faith in Christ and some thirty newcomers attending nightly. Please pray for this new pioneer work. Jesse Fitch writes: “Russian law prohibits the foreigner from being in the land for more than 90 days, and it is reported that many evangelical missionary families have left the country. It was a privilege during the Spring and Fall visits to teach God’s Word at each assembly. Funds were provided for the remodeling of one hall and a gas line installed at another. Some of the necessities of saints were met. They expressed their deep joy and gratitude. March 7-8, in the Matoaca Elementary School (2 blocks past the Gospel Hall) with Prayer Meeting on Friday, March 6, at 7:30pm in the Gospel Hall, 6204 River Road, Matoaca. First meeting on Saturday at 10:30am. Contact John Nobles at 804 265-5455, or jnobles6@aol.com. April 11-12, commencing with Prayer Meeting on Friday, April 10 at 7:30pm. Ministry begins on Saturday at 10am. Lord’s Day: Bible Reading 9am., Breaking of Bread 10:30am. All meetings in the Gospel Hall. Corr: Gary DeGroote, 28073 WestBrook St., New Hartford, Iowa 50660; Tel: 319 983-2713; E-mail: gdegroote2@msn.com. April 10-12 in the Premier Ballroom and Convention Centre, 9019 Leslie St., Richmond Hill. Meetings each day at 10am (except Lord’s Day), 1:30, 3:30, 7 and 8:45pm (except Lord’s Day) Prayer meeting on Thursday, April 11 at 7:30pm in Langstaff Gospel Hall, 1300 Langstaff Rd. Corr: Don Jennings, 53 Karnwood Dr., Scarborough, ON, M1L 2Z7; Tel: 416 757-7019, and Ian Margerison, 47 Manor Ridge Trail, Mount Albert, ON, L0G 1M0; Tel: 905 473-5400. Invited speakers: T. Baker, N. Crawford, Bryan Joyce, W. McBride (N. Ireland), H. Paisley, P. Ramsay, D. Shutt, D. Thompson (Columbia), and D. Vallance. March 28-29, Bible Reading Conference with Prayer Meeting Friday at 7:30pm at the Gospel Hall. All other meetings at the North Crawford High School north of Gays Mills. First meeting on Saturday: 10am. Breaking of Bread on Lord’s Day 9:30am. Bible Readings on Ephesians 4-6. For accommodations , please contact Richard M. Dudgeon, Tel: 608 734-3639, E-mail: rmdudgeon@juno.com, or Wayne Granzow, Tel: 608 874-4760, E-mail: wcgranzow@centurytel.net. Outlines of the readings and order of meetings will be sent on request. Elton and Ruth Fairfield (Japan): Email address is no longer in use. All other contact information remains the same. Maxine Orasuk: 113 Primrose Drive, RR#4, Cornwall, PE C0A 1H0; E-mail: morasuk@eastlink.ca. David and Allison Petterson: 4135 Stoney Creek Drive, Lincolnton, NC 28092; Tel: 704 732-1080. Mr. J. Edwin Long of N. Ireland, on November 14, age 64, after a long illness borne with patience and dignity. He was saved in February 1964, and in fellowship in the Cardy assembly. He had a successful business in the car trade and customers spoke highly of him. Knowing the seriousness of his illness, he asked the hospital to allow him to speak at the Lord’s Day gospel meeting to which he invited his customers and other dealers. Many attended, some never in the hall before, to hear his testimony and a short, simple gospel message. The very large funeral was conducted by J. G. Hutchinson, J. Palmer, and B. Currie, with S. Williamson and M. Radcliffe at the graveside. Prayer is valued for his widow, son, and daughter, all in assembly fellowship. Muriel D. Walberer of Phoenix, AZ, on November 15, age 82. She was born in New York City, the daughter of George and Blanche Duff. As a young girl she was very interested in church activities and remembers hearing evangelist Gypsy Smith preach the gospel. She was awakened to realize that church-going was not salvation, and at age 20 was saved through the truth of Romans 10:9. She and her husband Eric moved from New York to Akron, OH, where they were in the assembly for ten years, and then moved to Phoenix. In the Phoenix and then Sunnyslope assemblies, they are remembered for their faithfulness and hospitality. Failing health did not keep her from attending every meeting until hospitalized. The Lord gave them four children and 12 grandchildren, all saved. At the large funeral, J. Dennison gave a faithful message of remembrance and invitation to know Muriel’s Savior. T. Baker gave comforting words at the cemetery. Rose E. Brown of Ontario, WI, on November 19, age 87. She was saved in 1940 through the truth of 1 Timothy 1:15. Rose and her husband, Paul, were in fellowship at Western Ave. Gospel Hall in Waterloo, IA, in 1958. In 1998, they moved to Wisconsin to be near their son and family. They were consistent examples to others, and sought to be a help whenever there was a need. The last month she was cared for in the home of her son and daughter-in-law. Her husband, Paul, her son, Naasson and his wife, Peggy, survive, along with four grandchildren. The funeral was shared by R. Orr, K. Hendrickson, and R. Doll. Lacel Curry of Akron, OH, on November 20, age 98. Our dear sister was saved at the age of 14 and received into the fellowship of the assembly four years later, and continued with us for 80 years. Lacel was a very practical sister, always helping others. If there was a need she could be counted on and was a real blessing to saint and sinner. She was predeceased by one son, and leaves another son for whom prayer is requested. J. Donaldson, D. Metcalf, and K. Webb shared the funeral service. Cyril Flint of Paradise Valley, AB, on November 25, 2008, age 84 years. He was saved in his early teens; his parents were saved four years prior to this. He was received into the Paradise Valley assembly soon after it was formed in 1938. The assembly was dear to his heart and he kept the doors open when numbers were few. He was faithful in attending the meetings until failing health required a move into a home in Lloydminster, AB in 2005. He is survived by his wife, Lillian (Dunn), six children and their spouses, one daughter, 13 grandchildren, one great-grandson, and one sister, Barbara Lock (Flint). The funeral was well-attended by the community and officiated by G. Williams. William Hynes of Unionville, ON, on November 15, age 83, after a lengthy illness. Our dear brother was saved as a teenager in N. Ireland. He immigrated to Canada in 1956 and was received into fellowship in the Highfield Rd. assembly. He was followed by his wife, Ellen, and their two children in 1957. He fellowshipped in Windsor and Hamilton, and most recently in Unionville. In the early 80’s William took an early retirement to be able to help smaller assemblies in ministry and gospel. He was a serious Bible student and during that time he also wrote three books on the Revelation. In 2001, he entered Bethany Lodge where he continued to help with Bible studies and occasionally in ministry at Unionville while still able. During his illness he did not complain and was very appreciative of the care given to him and of visits by the Lord’s people. He was predeceased by his wife, Ellen, in 2007 and is survived by his son Terry (Leslie) of Elmira, ON, daughter Judi (Sterling) Payne of Mississauga, ON, and granddaughter Sarah of Elmira, ON. Words of encouragement and a faithful gospel were spoken at the funeral by P. Glenney and E. Kalmbach, and A. Dryburgh prayed at the graveside. Mr. James (Jim) Johnston of N. Ireland, on November 24, 2008, age 88, following a short illness. He was saved at 16 years of age while attending meetings in Ballywatermoy in 1936 conducted by bre. Stewart and Wallace, and shortly afterwards came into assembly fellowship there. A few years later, he was commended to the Wellington Street assembly, Ballymena. In full fellowship with that assembly, in September 1950, he became one of the foundation members of the assembly in Harryville, where he was an elder, and also correspondent for many years. He was a godly, consistent, steadfast brother, who loved the Lord, His Word, and the assembly, and was at all the meetings until almost the end. Employed by Northern Ireland Railways, he was a signal man until his retirement. T. McNeill spoke words of comfort and gospel at the large funeral service in the hall, and at the graveside J.W. Martin preached the gospel. Other local brethren helped at both services. Prayer is valued for his dear widow, son, and two daughters. 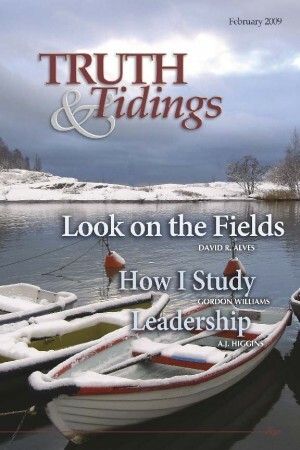 Truth and Tidings will soon be making booklets available to assemblies for distribution. These will be small and suitable for a tract rack at the back of the hall. They will answer many questions which visitors pose when they visit an assembly. We hope to have these printed shortly and will make them available through local Christian booksellers and also through Truth and Tidings. Despite the best efforts to give thanks to those to whom thanks is due, one name was unfortunately omitted from the January Truth and Tidings. Shawn St Clair has given unselfishly of his time and talent to maintain a web site for Truth and Tidings which not only enables believers to access the magazine online, but also to search by subject through past issues. His labor is taken for granted by us all. He is always on time and does an excellent job.